WinX DVD Ripper Platinum can easily rip and then play DVD on Apple iPad 4/3/2, iPad Air/2, iPad mini/2/3/4, iPad Pro devices! There always have been many tools and ways to unlock/jailbreak iPhone 6/5/4 and iPad in several generations. For example, a long time ago, a new "jailbreak" for the iPhone and iPad was released by hackers, and allows users to run third-party software with features not authorized by Apple, including multitasking. After the release of the new-generation of iPad (iPad Air) with higher-resolution Retina Display, longer 10-hour battery life, A7X prosessor, 4G LTE and iOS 7, there are many new cases of jailbreaking this gadget. But of course, this is surely not the same case with DVD to Apple iPad converter and ripper. At this time, iPad news comes to the most attractive Headline in both Apple website and magazine. And apart from illegal Jailbreak iPad news, iPhone, iPod, WinX DVD Ripper Platinum comes timely to make Apple iPad users' Digi-life much more colorful: play and enjoy DVD movies on Apple iPad. 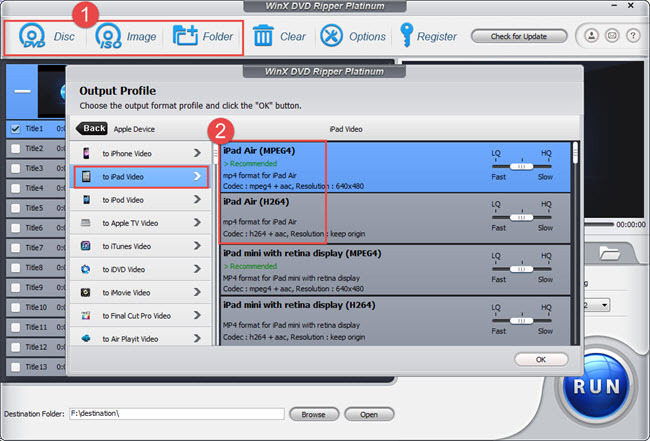 How to Play DVD on Apple iPad/2/3/4/Air/Mini/Pro? In order to play DVD on Apple iPad, you should first rip and convert DVD to Apple iPad. Now free download WinX DVD Ripper Platinum or download DVD Ripper for Mac. After few seconds installation, the main interface of this DVD to iPad ripper will pop up before users' face. Click "DVD Disc", "ISO Image"; or "Folder" button to load all kinds of DVDs to WinX DVD Ripper Platinum. Select play DVD on iPad Air 2 (H264 or MPEG) for example. Click "Apple Device" -> "to iPad video" -> "iPad Air 2 (H264 or MPEG)" by order to set iPad Air 2 as the output device. Click Browse button to select the destination folder of ripped movie video for playback on Apple iPad. You can also set parameters of the output video by clicking the setting button on the interface. Click RUN button to start the DVD to iPad (Air 2) ripping, and after successfully conversion, you can play DVD on Apple iPad (Air 2) anywhere you like. Besides, WinX DVD Ripper Platinum supports normal DVDs, CSS protected DVDs, Sony ArccOS DVDs and all region 1-6 DVDs. It is the unique DVD ripping program which supports decrypting DVDs to iPad with the latest copy protection technology such as Taken 3, Fifty Shades of Grey, The Wedding Ringer, The Hobbit 3, The Gambler, Big Hero 6, Interstellar, Into the Woods, Unbroken, Night at the Museum: Secret of the Tomb, The Hunger Games: Mockingjay Part 1, The Interview, Birdman and The Theory of Everything. MKV to iPad - Easiest Way to Play MKV on iPad. Blu-ray to iPad - Copy and Backup Blu-ray to iPad - Create Digital Copy of Bluray to iPad. Apple iPad / iPad 2 / the New iPad - Tablet computers developed by Apple Inc. with size and weight falling between that of smartphones and laptop computers in the current market.